Closed for the following holidays: New Years Day, July 4th, Thanksgiving Holiday on both Thursday & Friday, Christmas Eve, and Christmas Day. During our general office hours we are available by phone for all the business we conduct. This includes inquiries about and booking entertainment, inquiries about our merchandise, and inquiries about our dance studio and classes. In person, walk-in service for any of these items is available during the same hours that our retail store is open (Tuesday – Saturday 10:00 AM – 3:00 PM); however, if you wish inquire or book entertainment in person, or inquire about our dance classes, we strongly recommend you call first to make an appointment. This is to ensure that the person you need to talk with is in the office and not on a client site conducting a performance. Classes for our regular dance and Hawaiian arts program are held in the evenings on Mondays, Tuesdays, Wednesdays, & Thursdays, and during the day on Saturday from September through May. Summer Classes are held on Monday and Tuesday evenings and Saturdays during the day during from June into August. Closed for the following holidays: New Years Day, July 4th, Thanksgiving Day, Christmas Eve, Christmas Day, Memorial Day, and Labor Day. *** Although we operate under regular and standard store hours, we strongly recommend that you call ahead before coming if that is possible for you to do. It happens at times that performance obligations require us to close our store because our store staff is needed at a show or event. Calling ahead assures you, our valuable customer, that we will be here to serve you when you arrive. his owner and trainer. Call and speak with (or leave a message for) Lou. Scottie the Parrot SM is owned and operated by LCC Enterprises, a third party separate from the Barefoot Hawaiian. Quotes and contracts for Scottie the Parrot are arranged directly by his owner and trainer and are provided separately from those of the Barefoot Hawaiian. Scottie the Parrot SM and the Barefoot Hawaiian have a mutual working relationship that benefits your event. We work together to make it the best it can be. Further details on how we work mutually can be provided during your inquiry. The Barefoot Hawaiian is available for Polynesian Entertainment around the world. Please allow sufficient lead time for international bookings. 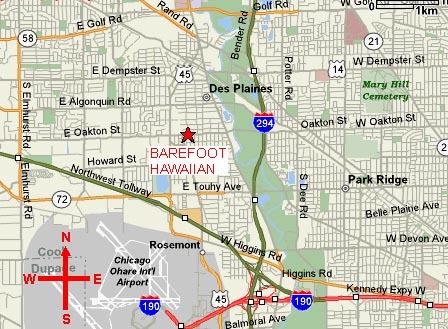 The Barefoot Hawaiian regularly performs throughout the continental United States and Canada. For bookings outside of the Midwestern region please allow sufficient lead time for us to accommodate your needs. Our core operating area is the greater Chicago and Chicago Land region, Wisconsin, Indiana, Michigan, Iowa, and Missouri. We regularly service this region in volume. Have a last moment need? Call us. With our staff of over 130 performers, we may be able to book your event with relatively little lead time. In the greater Chicago Land area, we are often able to provide same-day service. 10 minutes from O'Hare International Airport, and 5 minutes from both the I-90 and the I-294 Highways. We have plenty of free parking. Clients: Please provide your feedback to us directly either by phone or by the confidential email address that was used in our communications when setting up your event. Guests of Private Parties: If you were a guest or customer of a private party (this would be any event not listed in our Event Schedule web page), then this event was run entirely and exclusively by your host. The best method of providing your feedback would be directly to your host. They are in the best position to collect and consolidate all feedback and pass it on to us along with their comments so we may respond or act on it most efficiently. If the circumstance is one of an unresolved issue between you and the event's host, you must communicate the matter directly with the host. The Barefoot Hawaiian does not become involved in any internal matters of private events and parties. This applies if you were the customer, guest, or audience member of an event that was open to the public but not sponsored directly by the Barefoot Hawaiian. (Note: all public events are on our Event Schedule page.) For this, the best method of providing your feedback would be directly to the host, promoter, or sponsoring organization that held the event. They are in the best position to collect and consolidate all feedback and pass it on to us along with their comments so we may respond or act on it most efficiently. While we cannot become involved in resolving any dispute, our reputation with our audience members is our most prized and valuable asset. An aggregate of feedback about a particular event, will help us determine whether we wish to return to performing at that event or not. Problems browsing or navigating this web site? Also note that this site uses pop-up windows. These pop-ups occur only in response to a request you have entered or clicked on. No where in this web site do we use pop-up windows to present advertising or solicitations. If you are using a pop-up blocker, you must — and you may safely — allow this web site to create pop-up windows. The Email Addresses contained in this site are rendered in a way to make them resistant to Automated Email Address Harvesting Programs and Robots often used by spammers. Reducing our susceptibility to spam attacks means faster and more efficient service to you because a higher percentage of emails are legitimate communications rather than spam that we must filter out. Accomplishing this means, however, that a little extra typing is required on your part. Clicking on an Email Address contained in this web site will open an Email composition window of your default mail program (if your system is configured to do so). The "TO" field, however, is not automatically filled in, requiring you to type in the specified Email Address yourself in that field. Our web pages were designed to be printer friendly with all modern browsers. To properly print one of our web pages you may need to change the settings in your browsers printer setup. These settings may involve using a print reduction to fit the entire page onto a standard letter-size sheet of paper or specifying print in landscape mode. This web page has discovered an error in your browser's configuration that will result in this web page not rendering correctly, functioning correctly, or lacking in some degree of functionality that would normally be supported. If you are using Security Zones to determine web sites safe for scripting, we guarantee that you may safely place this site in the Trusted Sites zone.